LA Sheriff’s Transit Bureau North Deputies and Pasadena Police Officers saved the life of a man who was choking while eating dinner on Sunday, May 1st, 2016, at approximately 7:00 PM. 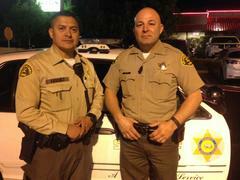 Deputy Arnulfo Aguirre and his partner Deputy Vladimir Vasquez-Flores, were assigned to the Metro Gold Line. 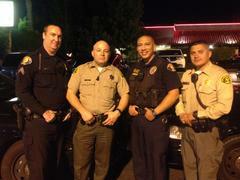 Deputies Aguirre and Vasquez-Flores were on their dinner break at the Stonefire Grill in Pasadena, California. 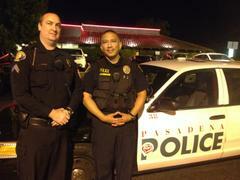 Seated nearby were Pasadena PD Officers John Calderon and Tom Blanchard, also on their dinner break. Deputy Aguirre noticed a male waving his hands in the air in obvious distress. Mr. Jonathan Staffeldt, who was dining with his family, was choking and unable to breathe. Aguirre ran towards Mr. Staffeldt and began to administer abdominal thrusts to dislodge any obstruction. After approximately ten thrusts, Pasadena Officer John Calderon took over and delivered a few more abdominal thrusts. Their efforts proved successful as the food obstruction was dislodged and Mr. Staffeldt was again able to breathe. Pasadena Fire Paramedics responded to the restaurant and treated Mr. Staffeldt. He appeared to be breathing fine on his own and declined any further treatment. Mr. Staffeldt commended the quick actions of both the deputies and police officers, stating that they had “saved his life” and commented that he believes the outcome of his ordeal would have been much different had the deputies and officers not been present. The Transit Policing Division of the Los Angeles County Sheriff’s Department is comprised of four separate bureaus. The Transit Bureau North is one of those bureaus responsible for providing police services to the Los Angeles County Metropolitan Transportation Authority (Metro), including their patrons, employees, vehicles, and properties. The Transit Bureau North has a close working relationship with the Pasadena Police Department as several Metro bus lines and the Metro Gold Line run through the City of Pasadena. Together these agencies work diligently to keep Metro patrons and the citizens of the City of Pasadena safe when they “Go Metro”.